I have a confession to make- I collect Bibles. This might sound odd to some- how many bibles does a person need? But I love having various translations so I can compare any verses that may be confusing, etc. So I have a couple NIV, NLT, NKJV, The Message, and so on. I thought I was pretty well covered as far as translations go but when I saw this brand new translation, I was excited to check it out. Now naturally because of lack of time, I have not yet been able to read the entire New Testament over again. 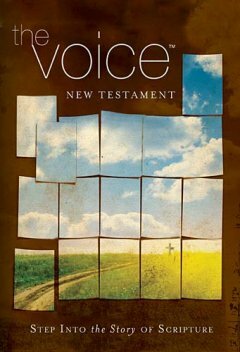 Instead I have read through some of my favorite chapters and verses to get an idea of the style of The Voice. Starting out, I expected it to be very much like The Message. The Message, for those who do not know, is more an interpretation than direct translation. It paraphrases and puts things into modern speech to make things more understandable. This is not all what I found, it is as the description states, 'faithful dynamic translation of the Scriptures done as a collage of compelling narratives, poetry, song, truth, and wisdom'. Many of the verses I found to be very similar to the other versions I'd compared them too, but certainly much more poetic. There are also many sections that are written as a screenplay. To be honest, I'm undecided how I feel about those particular sections. There were also forwards for each book explaining what was going at the time/places that these messages were given and giving us a better understanding of the context, this is not something exclusive to The Voice, but something I always find beneficial in any bible. There are also several reading guides such as readings to celebrate Advent, Lent and Easter, daily readings for personal growth and reading the new testament in 24 weeks. There is also a topical guide and explanations on the various titles of Jesus, which I found very interesting myself. Overall, this is a great bible and I'm very happy to have been given the chance to review it. While I cannot see completely replacing my trusted NIV with this, I am happy to have it for a little variety and is great for someone who does not enjoy the traditional translations as much. I also look forward to seeing the Old Testament version also (available April 2012), as I have a difficult time getting through that myself!! *I received a copy of The Voice for free from the publisher in exchange for this review. All thoughts are my own.